A fun way to play a new form of basketball in your group! Instead of shooting at real hoop why not shoot at someones face, that sounds like a lot more fun! 1. Basketball Hoop. These are simple ones that you can attached to the back of your door. The cheapest place you can find them is at the dollar store and Walmart. 2. Head Band. You will want to buy the most heavy duty head band here. It is going to have to hold up the basketball net so the stiffer the head band the better! 3. Foam Basketballs. If you don’t want to spend a ton of money on foam basketballs then I would suggest just finding some play pen balls lying around. They should do the trick for ya. Cut two holes at the bottom of the basketball hoop and attach the hoop to the head band. You can use a small nut and bolt set or use a zip tie. You will want this to be as secure as possible. That’s all for prep now we are ready to have some fun! Have students stand about 10ft away from each other. You can play this a couple ways. You can do just like they do on Fallon and it can be the first to three basketballs playing “head to head” (pun intended). You can also pick 4 contestants and have teams of two. On each team you will have a shooter who will shoot on their teams basket. The teammate with the basket on their face can help direct the ball into the goal. 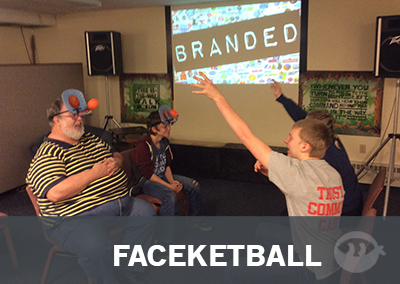 Either way it’s pretty amazing watching students trying to use their face as a baseball hoop! Nice! I’m going to do this with water balloons.